The world’s most Popular Jtag unit for ARM cores. Any ARM7/ARM9/ARM11, Cortex-M0,M3,M4, Cortex -R4/R5 and more..
has support for Renesas RX Family as well. 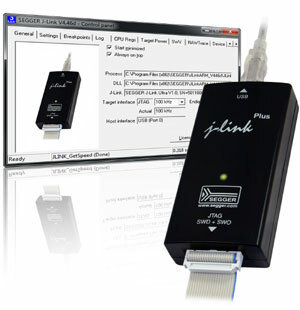 J-Link PLUS is a USB powered JTAG emulator for ARM cores. It connects via USB to the Windows (2000 or later) PC host. J-Link Pro is a refined version of the regular J-Link. It has an Ethernet interface in addition to the USB interface, as well as two additional LEDs which are used as hardware status indicators. It connects via Ethernet or USB to the Windows (2000 or later) PC host. J-Link Ultra is a JTAG/SWD emulator designed for ARM/Cortex and other supported CPUs. 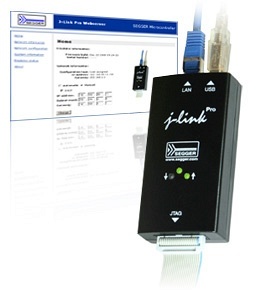 It is fully compatible to the standard J-Link and works with the same PC software. Based on the highly optimized and proven J-Link, it offers even higher speed as well as target power measurement capabilities due to the faster CPU, built-in FPGA and High-speed USB interface. Target power consumption can be measured with high accuracy.